Council of the Law Society of the Transvaal announced an amendment to the voting procedures for the election of its members. This apparently undemocratic action, a circular advising people how to vote and the Council’s cavalier treatment of a Pretoria attorney, Mr GA Aitchison who had protested, caused an outcry among Johannesburg attorneys. In July a meeting of was convened by Mr I Maltz to discuss the issue. Voluntary organisations not for profit are fragile organisms and in the absence of a dedicated and energetic member (or members) soon become dormant. So it was with an earlier association of Johannesburg attorneys, but the profession was fortunate in finding such a dedicated member in Gertie Horvitch, who devoted time and the secretarial facilities of her office to the affairs of the association for many years. Further informal meetings were held. A provisional committee was elected consisting of Messrs TE Lawlor, WQD Routledge, CF Munnik, AE Ettlinger, HL Dryden, VC Berrange, WJ van Gorkom, AE Israel, (It was subsequently decided that a Law Society council member should not be a member of the committee, but should be invited to attend its meetings as an observer), H Cranko, L Japhet, AH Cohn, I Maltz, and ML Graff. Miss Horvitch was elected secretary of the new Association. Further discussion took place on the issue of representation on the Law Society council and a suggestion by Mr Aitchison of Pretoria that council members should be elected to represent particular areas was approved and was ultimately accepted by the Law Society. Soon after the first meeting the energetic and dedicated Gertie Horvitch sent out applications for membership forms; by the year end the JSBA had 112 paid up members out of the attorneys practising in the area. The association did not at any time record racial or other personal details of its members, but inspection of the names indicated that approximately 75% were Jewish. There were 3 women and 2 Indian members but no “native” names were detected. This probably reflected the racial and gender composition of the profession at the time. This was illustrated by an incident in when the Council invited J Kruger the Minister of Justice, (who had remarked when advised that a Black activist had died while in the hands of the security police that “it left him cold”) to be its guest at that year’s Law Conference. In the political climate of the time this was considered by the Johannesburg committee to be inappropriate and it asked the Council to withdraw the invitation; it refused to do so and moreover asked William Lane, a member of the Association and a Council member who was to have chaired the conference, to resign as chairman. A committee consisting of attorneys J Israel, F Lowenberg, A Ettlinger and I Maltz was elected and given the task of drafting a constitution for the Johannesburg Side Bar Association (JSBA), using the then common manner of referring to the attorneys profession. It was emphasised that the Association would be neither a branch of the Incorporated Law Society of the Transvaal nor in competition with it. At the meeting, attended by 60 attorneys and chaired by Mr J Israel who was a Council member, it was agreed that a new body to focus on problems peculiar to the practice of law in Johannesburg, and which would act as a conduit for the expression of local opinion, should be formed. A good and close relationship with the Law Society Council was established, but this did not preclude occasions when they disagreed and there were occasions when the Johannesburg committee felt that the Council did not deal evenhandedly with all its members. In particular, some members felt that the Pretoria committees’ points of view were more sympathetically received than those of the Johannesburg committees; this could possibly have been due to a Council and Pretoria committee sympathetic with the Nationalist Party government after it came to power in 1948, (which as a whole the Johannesburg committees were not) as well as the neighbourliness between them. The Incorporated Law Society of the Transvaal welcomed the formation of the JSBA and undertook to keep in touch with it and to give full consideration to any suggestions it might make. 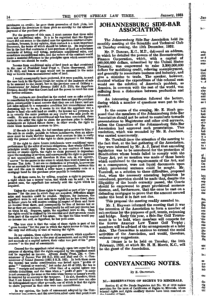 Indeed the minutes of the Association’s committee meetings in the years that followed, suggest that ideas about innovations and improvements, both to the profession and to the law were often discussed and referred to the Law Society for possible implementation, but it appeared that there was little feedback from the Council and this gave rise to a complaint expressed at a committee meeting in June 79 that the exercise appeared futile. However, many Johannesburg suggestions turned up later, sometimes years later, as Law Society activities. The first formal meeting of the committee was held on 14 December and was chaired by Mr A Ettlinger. 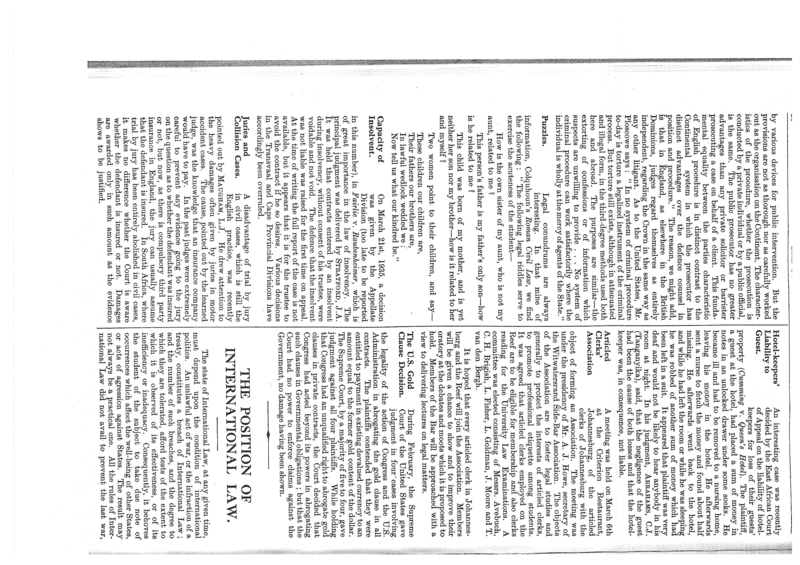 It was agreed that the business of the committee would cover the functioning of the courts, legislation of interest to attorneys, conveyancing, estates, legal aid, the law reports, social activities and, in the period immediately after the end of the war, the rehabilitation of returning soldiers. The committee started functioning immediately. As problems arose, committee members experienced in the particular area concerned were asked to deal with them and report to the committee, until 1963, when formal sub-committees were appointed to deal with the different areas of business and report at the monthly committee meetings. The committee’s activities led to early recognition and the Association was soon accepted by Government departments and unofficial organisations, including international legal bodies, as representing the attorneys practising in Johannesburg. Communication with members was established by way of regular newsletters and circulars, which were distributed by a specialist firm until 1974. The world was at war and many attorneys and articled clerks had enlisted and would, on their return to civilian life, be out of touch with current developments in the profession. It was also expected that when demobilisation took place there would be an influx of new articled clerks. The sub-committee was set up to prepare to assist in their rehabilitation into the profession. It decided that its aims would be best realised by collaborating with all government and welfare organisations which dealt with the welfare of soldiers. The Association communicated with and sent representatives to the BESL Housing and Rehabilitation committee and the local Demobilisation Committee, and planned a series of lectures for returning attorneys on changes which had taken place in the law while they were away. In the event, this fell away as the University of the Witwatersrand set up a course of lectures for returning soldiers, but the committee members continued to serve on the organisations assisting them. Although the JSBA and the Johannesburg Bar Council frequently co-operated on matters concerning the courts, there were equally frequent complaints about counsel’s fees. The Law Society was also giving attention to the problems of returning soldiers. (At its AGM it announced that loans payable over 10 years would be granted to those in need) and the Johannesburg committee agreed that it should not duplicate its activities but would make suggestions for its consideration. It did, however, invite its members to advise the committee of any vacancies which may occur, and thence forward acted as an informal staff placement service for its members and professional work seekers. Johannesburg attorneys suggested that a paid secretary, preferably an attorney, should be employed. This was ultimately implemented. Membership of the Association had risen to 200 and stayed close to this figure for some years. From the beginning it was plagued by the apathy of members: meetings, including the Annual General Meeting and social meetings, were poorly attended and subscriptions were left unpaid. Calls for information to assist the committees in their work were ignored. Thanks to Mrs Katzeff’s efforts membership continued to grow; when Miss Wolkin took over the management of the office she continued the work of recruitment. The annual subscription was initially one guinea (R2.10) and stayed at this amount. 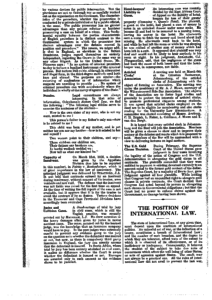 The JSBA was advised that the Bar Council had set minimum fees for the various procedures in divorce matters, being at the time drawing the declaration, trial and return of restitution order and that furthermore unless the declaration was drawn by counsel he would not appear at the trial. The committee met with the Bar Council and protested against these fees claiming that they would make divorce unaffordable by many clients. The draft Constitution prepared by the committee was adopted at a subsequent meeting. Among its objects were: i) to co-operate with the Law Society of the Transvaal ii) to advance the interests of the legal profession iii) to further legal studies among its members iv) to mediate between attorneys if called upon to do so. Attorneys practising in Johannesburg, their legally qualified assistants and Articled Clerks (candidate attorneys) were eligible for membership. As could be expected, amendments to the constitution were made to the constitution from time. An early indication of the range of the activities of the Association and the vigilance of its committee members occurred when, while the Income Tax Bill was being debated, the committee telegraphed the Minister of Finance objecting to certain sections of the Bill. Although the constitution of the JSBA allowed articled clerks to become members nothing was done to draw them in until this year when their Association was approached. In October the Johannesburg Articled Clerks Association (JACA) invited attorneys to attend its meeting on “Reform of Training of Attorneys”. As was inevitable, considering the transient nature of its membership pool and of its committee, the Articled Clerks Association soon ceased functioning. A move by the Government to bring the professions under the provisions of the Wage Act was opposed. The committee communicated with the East London and Natal associations with regard to of setting tariffs fees for their members, but decided that there was so much variation in the practices of the members of this association that they themselves were the best judges of what their fees should be, and a tariff should not be imposed upon them. The question of counsels’ fees cropped up regularly in the Association’s history. The Bar Council would announce increases unilaterally, and the Association would object to no avail. The committee suggested that the Annual General Meeting of the Law Society should be a social occasion and its offer to arrange a lunch and sports event was accepted. The meeting was a success and was repeated for subsequent AGMs held in Johannesburg. The Bar Council announced a surcharge on fees in matrimonial matters, which it justified by the need to assist junior counsel. Special general meetings were called to protest against the surcharge but the Bar Council was adamant and the JSBA could only recommend that their members mark their briefs if they were unhappy with the fees, although this procedure did not meet with the approval of the Law Society on the grounds that this could lead to ill feeling between the professions. The Bar Council countered this suggestion by stating that the surcharge would nevertheless be added to all fees. Articled Clerks Association became moribund. In 1950 the Law Society proposed to divide its membership into area “circles” each with its own circle committee, to make communication with its members easier. Initially it was thought that this would make the JSBA redundant, but in fact it was accepted that the Association was already acting, and would continue to act, as a circle committee. As it frequently acted on behalf of all attorneys in Johannesburg it received the subsidy, based on the number of attorneys practising in the circle, paid by the Law Society to all circles as well as an additional sum to encourage additional activities of the committee. Thus the Association wore two hats; as the Circle committee it was, of course, part of the Law Society and under the control of its Council but as an Association it was independent. This led to occasional disagreement between the Law Society and the Association. A resolution to change the name of the Association by amending the words “side bar” was debated at the AGM but no consensus was reached on an alternative and the matter was postponed. The first annual Circle conference of representatives of all circles in the Transvaal was held, and gave attorneys an opportunity to exchange views on matters affecting the profession ahead of the Law Society annual general meeting. Among topics discussed were the removal of a Latin qualification from the attorneys examination, and a proposed bye-law which would compel regular auditing of attorneys’ accounts which was considered unacceptable by the delegates. Ms Gertie Horvitch continued to act as Honorary Secretary and all secretarial work was done by her staff in her office until 1955 when she pleaded that the JSBA rent an office and hire a paid part time secretary. Articled Clerks Association was resuscitated and its new committee drafted a constitution which it submitted for comment to the Association’s committee. Liaison was established, clerical assistance was offered and its chairman was invited to attend the Association’s committee meetings. The Association also agreed to assist financially on occasion and Mr Lane undertook to assist the JACA in collecting data regarding the conditions of employment of articled clerks, i.e. salaries, duties, leave etc. A questionnaire was prepared but as a comprehensive list of clerks was not available, the results were incomplete. Communication with clerks was always difficult; the Law Society was never able to supply an up-to-date list of registered candidate attorneys and it was therefore impossible to establish its constituency and so obtain a reliable expression of their views. Ironically, a proposal making auditing of attorneys’ accounts compulsory, opposed at the Circle Conference held before the AGM, was approved as a result of an address by Mr Lund on the procedures adopted in England. Judge Basil Wunsh, the first judge appointed from the ranks of the profession, joined the JSBA. As a result of problems which arose with the disposal of documents in the possession of attorneys who were struck from the roll, the committee requested the Law Society to introduce a bye-law for the appointment of liquidators of the practices of these attorneys who would have the power to take possession of documents and ensure that they fall into the correct hands. The Law Society AGM was to be held in Johannesburg. This coincided with a festival year for Johannesburg, being the 70th anniversary of the establishment of the city, and the JSBA decided to celebrate. Ms Horvitch, during a holiday visit to London, persuaded the past President of the English Law Society, Sir Charles Norton, and its Secretary, Mr J G Lund, to be our guests during the week of the AGM. The AGM and the annual Circle conference were combined into a two-day event, which ended with a banquet at the Carlton Hotel. The visitors were then entertained at the Kruger Park game reserve. In March the JSBA moved into an office next to Ms Gertie Horvitch in His Majesty’s Building and hired in turn a Mrs Goldstein and Mrs Whitehouse as part time secretary but neither stayed very long. As a result of Mr Lund’s speech at the AGM, a joint committee of the Bar and the Side Bar was formed to discuss matters of common interest. On the agenda of the first meeting were the splitting of the jurisdiction of the Magistrates Court, the Supreme Court rules and Counsels’ fees. The joint committee continued to meet, first monthly and later, on an ad hoc basis, as the need for common action arose but it would appear that meetings were convened more often that not by the Association rather than the Bar Council. The membership of the Association continued to grow very slowly the committee undertook a serious recruitment drive. Ms Horvitch was elected as vice-chairman and Mr Seif took her place as Honorary Secretary. She was elected as chairman. Mr A Ettlinger represented the JSBA on the special committee established by the Law Society to discuss the fusion of the Bar and Side Bar, a topic raised by members at the Association’s AGM. Mrs Ann Katzeff was appointed. With her assistance the association succeeded in increasing their membership. The joint committee, attended also by the Registrar and a Judge, met to discuss the system used in the Registrar’s office, where defended matters were set down at the convenience of Counsel, often causing inconvenience for the attorney of record. Agreement was reached that the Registrar should be guided by the attorney not counsel. The JSBA learnt that interested young people were unable to find positions as articled clerks: the attention of members was drawn to the need to train new attorneys and an informal free professional placement service was established in its office. This service was, and still is used by those seeking articles and by some of the smaller firms seeking staff. Mr Len Ettlinger was elected to the committee, creating the unusual situation that father and son were committee members at the same time. In August the committee was approached by the Medical Services Plan with a suggestion that it sponsor a medical aid plan for its members. The idea was approved by a well attended special general meeting and after negotiations the committee undertook to administer the plan through its office. The committee debated the question of persons calling themselves “consultants” who were in fact doing legal work, thus encroaching on the work of attorneys. Members Sachs, van der Merwe and Block undertook to gather and collate evidence in the matter and draft a memorandum for submission to the Law Society. Attorneys Hayman and Aronsohn complained that the Bantu Affairs Commissioner proposed to administer the deceased estate of a black person from his office. The matter was referred to the Law Society who suggested that the matter should be referred to the Minister of Justice through the Secretary for Native Affairs. There is no record of the outcome of this complaint. Mr Ettlinger Snr. was co-opted to the Law Society Council. As the activities of the Association increased it became obvious that it could carry out its particular function of being of day to day service to its members best if the office was located in the Supreme Court. The committee approached the Registrar several times until July when it succeeded in obtaining permission to use Room 21 but only while it was not needed by the Court itself. Furniture was bought, a photostat machine and telephone were installed. The committee was asked to consider setting up a pension or provident fund for its members and their employees. Members were canvassed both among the Association’s members and at the AGM of the Law Society. There appeared to be some interest in the scheme. Later, in the late 1960’s and early 1970’s, when the Association’s committees became active in public relations and legal education the Law Society Council appeared to be reluctant to allow the Association to exercise independent initiative and required that all plans to arrange lectures on general legal and educational topics be cleared through it. This was expressed in a letter addressed to all circle committees advising that no circle may become involved in any situation which is not purely local or concerns any other circle without Council’s permission. This caused resentment among some committee members. The Association’s committees repeatedly expressed concern and disappointment that few Johannesburg attorneys attend functions and meetings and, in particular, the important Law Conference, held at two year intervals. As the conference was and still is, held at various centres, which involves delegates in the expense of air fares and hotel costs, the committee decided, that it would sponsor a committee member to attend and to report back to the committee, the Law Conference each year. The annual subscription increased to R3. In August the committee held its first meeting in the boardroom in Room 21(in the Supreme Court.) In time, the offices and their facilities proved to be useful to both Johannesburg attorneys and those from other areas attending the Supreme Court as well as advocates. In December, Mr Geach drew the attention of the committee to the draft regulations published by the government under Sect. 30(1)(h) which listed acts which could be performed by attorneys only, and which contained important omissions. This draft had been dealt with unilaterally by the Law Society which had met with the Minister of Justice without reference to the Association. A special meeting of members was called in protest. Due to the interest in a pension or provident fund, committee members Walwyn and Routledge approached the Accepting Bank and the Attorneys Employees Provident Fund was duly established. The enrolment of members of the fund was slower than expected, and the committee decided to advertise in De Rebus, but there was little response from the profession. Judge Basil Wunsh was elected to the committee 1967. In that year also The Association enrolled its first “native” member Mr J N Madikizela. Committee agreed that it was against a schedule of fees for its members and that should other centres wish to set such schedules they should justify them. Mr Ettlinger undertook to do a draft memorandum on the matter. The JACA had again petered out but again became active and an amended constitution was referred to the Association for comment and was ratified by the Law Society. The Association sponsored a dinner for JACA members. Meetings with the Bar Co. The two-counsel rule, i.e. that senior counsel had to be assisted a junior and that the junior was entitled to a fee equal to two-thirds of that of his senior was opposed by the sub-committee at its meetings with the Bar Co. In January the committee discussed the need for attorneys to arrange insurance against possible claims of professional negligence. The question of pro-amico reciprocity between the Bar and the Side Bar arose as a result of a query by a member; the committee agreed that such reciprocity was desirable. In January the Association subsidized its delegates to a national conference of articled clerks held in Cape Town. At this time also the recruitment of articled clerks received attention and the first such members were enrolled. Representatives of the JACA, usually the chairman, sporadically attended the Association’s committee meetings and reported on its activities and plans which were often abandoned for lack of support of their members or were beyond their means to carry out. The committee raised R600 by way of contributions from members, as a gift for the Chief Magistrate who retired. The committee discussed the question of calling for contributions from members for such gifts and decided that in principle it was not desirable but that court and other officials should be invited to meetings and luncheons at suitable intervals; the convenors of the various sub-committees were authorised to do so at their discretion. The issue of contingency fees was raised at a committee meeting, as a result of a query from Mr. Newton King. Messrs Ettlinger, Nel and de Kock were asked to discuss and draw the attention of the Law Society to the matter. 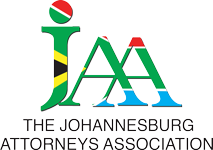 The name Johannesburg Attorneys Association (JAA) was finally adopted at the AGM in November. Early in the 1970s the government decided to enlarge the Supreme Court building by demolishing the northern section, leaving the southern section, which was declared a national monument, unaltered and erecting 8 floors of new courts and offices. In Room 21(in the Supreme Court.) The office efficiency was improved by installing a cardex filing system to cope with the increasing membership, and an electric typewriter was hired. The membership of the JAA was affected by the establishment of the Randburg court. The attorneys who practised in that area wished to form their own Association but as the area fell within the Law Society’s Circle II and according to the Law Society’s byelaws, no group of attorneys may form an Association without its consent; its status was uncertain. The committee learnt that the practice of an old and infirm attorney, BAS Smits, was being neglected and Messrs Walwyn and Creswick were asked to interview the attorney’s son with a view to offering assistance in winding up the practice. Some years later the need to establish a benevolent fund for its members again arose. It was noticed that a member, Mr B Tennet was in arrear with his contributions to the Medical Aid Fund that had been established, and on enquiry found that failing health had affected his income. The committee decided to assist him by paying his contributions and also referred the case to the Law Society which already had a provident fund. The Law Society refused to assist. The committee then decided to ask its members to pay a special levy, on a voluntary basis, of R2.50 the money to be used for members in need. It was suggested that the Professional Provident Fund should take over, but this was vetoed by the Law Society. Several of the larger firms responded positively and agreed to employ black graduates. Mr Wunsh (and later Mr Gush who continued with the work even after he resigned from the committee) and William Lane consulted the National Institute for Personnel Research (NIPR) and its head, Professor Gordon Nelson, agreed to test applicants free of charge and to refer suitable people to the committee. Promising graduates were then allocated to these willing firms. Some problems with The Medical Services Plan arose as several members who had joined the Plan failed to pay their monthly subscriptions. In one recorded case the committee agreed to meet these payments on behalf of the member. JAA secretary, Mr Isaacs, was invited to attend the Johannesburg Association’s January 1972 committee meeting to discuss the issue of forming their own Association separate from the Radburg court, with no apparent results. On the advice of Mr Kidd, the auditor, a more comprehensive bookkeeping system was installed and the committee agreed to employ a part time bookkeeper at a salary of R10 per morning and to buy an adding machine. The bookkeeper employed soon resigned and Mrs Katzeff agreed to attend to the work. The JAA committee found itself in situations where decisions were taken which apparently were not, according to the constitution, within its powers. It, for example, had assisted a member who had fallen into arrears with his contributions to the Medical Services Plan. 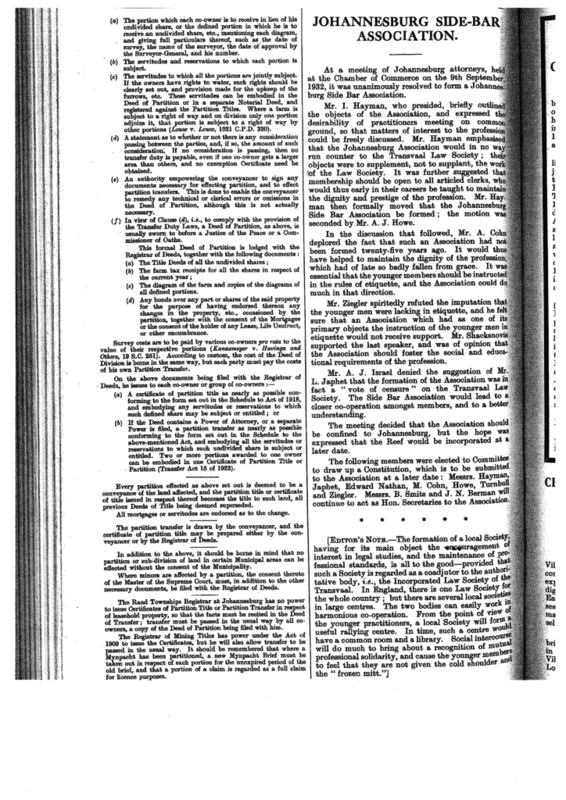 Accordingly amendments to the Constitution were proposed and carried at the 1972 AGM which added to its objects a) to express views on behalf of its members, b) to conduct lectures, seminars and study courses, c) to establish machinery for settlement of disputes among its members and to include Randburg and Sandton which were also part of Circle II in its “jurisdiction”. 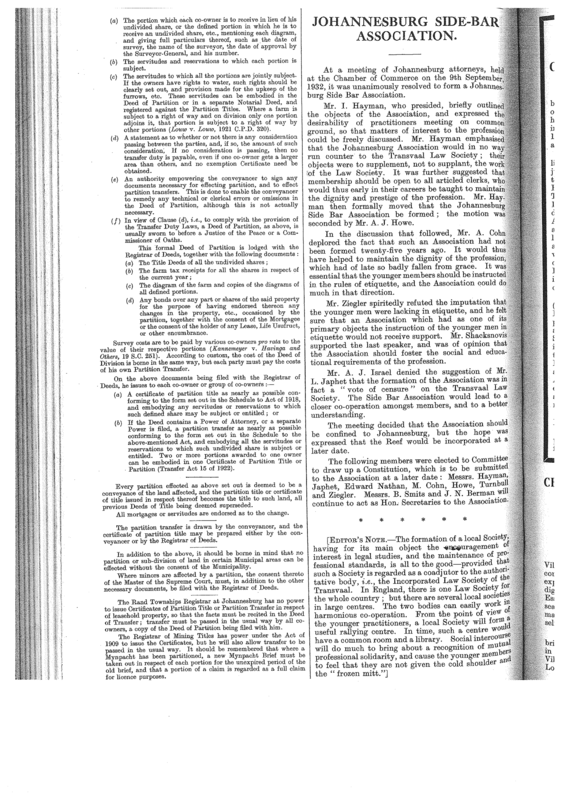 The wording of the resolution regarding the expression of views on behalf of its members did not meet with the Council’s approval and a revised version was submitted which read “To afford the opportunity to members to express their views and make representations on behalf of their members, provided that the Association will not express views or make representations other than to the Law Society on matters affecting attorneys in their practices outside Circle II ”. The Council at the same time intimated that the JAA’s constitution would be used as a model for other local Attorneys Associations in the Transvaal. A benevolent fund for its members was put as a resolution at the 1973 Annual General Meeting, at which Council members were present, they claimed this was unnecessary as R5 of members’ contributions to the Law Society was already set aside for such assistance. They claimed that at the time of the refusal to assist, that the special fund had run out of money! The committee accordingly lent the Law Society Provident Fund R2000 and then claimed a refund of the money already spent on the case. The refund was in due course received but there is no record in the minutes that the loan was repaid. At the AGM members of those firms which had employed Black clerks, with a single exception, reported favourably. At a meeting, the question of the re-election of Arthur de Kock as chairman for a third term arose; it was agreed that this was desirable and the constitution was amended limiting the tenure of the chairman of the committee to a maximum of three years. Mr de Kock was a tower of strength during his membership on the committee, involved himself in all the Association’s activities and was a talented lecturer. As of February a reported 10 Black clerks had been placed. 34 Black clerks had found employment. Committee decided that the communicative distribution of newsletters and circulars by specialist firm was too expensive and requested assistance from member firms. In the July issue, De Rebus carried an article by a Ms Schwartz, a journalist who had investigated the employment of Black clerks in the legal profession. She reported that the white clerks employed by the firm which had employed 3 Black clerks, had welcomed them and that the Black clerks had been accepted by their clients without any problem. An Afrikaans speaking firm, fearing that their clients would not accept him, had not exposed them to their Black clerk and many attorneys resisted the idea altogether. On the other hand the clerks themselves were handicapped by their lack of familiarity with basic commerce oriented concepts, particularly in the field of property law. Nevertheless there were success stories. By the end of 1974 the Law Society’s bye-law established that maximum one-third allowances on fees to correspondents were permitted but were not compulsory. The JAA office itself was frequently approached both by members and their clerks for advice regarding the going rate for salaries. The Attorneys Act specified a minimum salary of R50 per month which was obviously no longer applicable, and the Law Society Council, when approached for assistance, refused to comment as conditions in the offices of their members varied widely. The only advice that could be given was that consideration should be given both by the principal and the clerk to the usefulness of the clerk to his/her principal. The NIPR was again approached for assistance, but it refused a free service unless the committee could furnish follow up reports on those who obtained employment. The committee did not consider that it could do so and approached the Law Society for financial assistance. This was at first refused on the grounds that as it was not found necessary to test White clerks, there was no reason to test Black applicants. The Provident Fund was taken over by the Association of Law Societies, the trustees were replaced and the Fund was administered on the basis of countrywide membership. Mrs Katzeff acted as employees’ representative. In September the Law Society asked for information regarding salaries paid to clerks in Johannesburg and the committee according sent to a questionnaire to member firms. It was clear that salaries varied according the size of the firm and the qualifications of the clerk, and that Blacks and women were discriminated against. Attorneys practising in the Randburg area suggested that a new Circle be formed and as the Law Society could not accommodate them they were invited, to appoint representatives to serve on the Lower Courts sub-Committee of the JAA. This did not appear to satisfy them. Council reconsidered their decision to offer financial assistance and agreed to assist financially. The committee decided that the morning only services offered by the JAA’s office should be increased by extending its hours and Mrs Katzeff’s services, to a full day. There appeared to be a serious shortage of positions in attorneys’ firms for all graduates. Mr Mansell had obtained from the various universities an estimate of the number of people graduating from their law faculties each year and it became obvious that profession could not absorb so many clerks. The questions -should the system of articles be abolished? and if so what alternate training should be instituted? were debated by the committee and the Law Society was asked to raise the matter at the Association of Law Societies. The clerk employed by the firm Hofmeyr van der Merwe was admitted to practice in and commenced practising for his own account in Pietersburg. During building operations to enlarge the Supreme Court, the Court, and the JAA office, moved to North City Building in Plein Street, but as the office allocated to it was small, committee meetings were held in the offices of various member firms, usually those of Edward Nathan Friedland & Mansell and of Mendelow & Browde. Promises were made that the JAA would be accommodated in the new building and members of the Supreme Court sub-committee were, during building operations, invited to inspect the plans and commented constructively. At a meeting attended by the Johannesburg committee and the President of the Law, the attorneys practising in the Randburg area, again stated that they wanted their own circle. This was again refused and two attorneys practising at that court were co-opted to the JAA’s sub-committee. Mr Michael Per, while a member of the sub-committee, kept in touch with activities in the area and its Magistrates and reported regularly to the main committee but the demand for a separate circle was reiterated again and again in the years that followed. When Mr Per left the committee the committee’s contact with the area ceased. Again the sub-committee dealing with property matters became aware that the corresponding Law Society Standing Committee was in fact the sub-committee of the Pretoria Association and requested that a Johannesburg conveyancer be included. Late in 1976 the committee, in order to by pass the postal system and speed up communication with members, investigated the possibility of establishing a system of document exchange and, as in Mr Friedman’s opinion this would not be a contravention of the Post Master’s Code, approached the Postal authorities for permission to do so. The Post Office advised that it was planning to supply such a service itself but the service did not materialise and eventually the committee decided that the London system should be studied. Mr Ettlinger undertook to make inquiries during a visit to Britain and reported to the committee. Later the committee became aware that a document exchange firm existed and was extensively used by East Rand attorneys and decided to abandon its own plans. After 1977 the work(distribution of newsletters and circulars) was done from the Association’s office: the committee invested in an addressograph machine, which was later abandoned by Miss Wolkin in favour of a computerised typewriter. When Mr de Kock did not stand for election to the committee, he was co-opted! In January a special meeting of the committee was called to discuss a complaint received from two members regarding the manner in which the Law Society conducted its disciplinary procedure. They stated that they had been made to wait for a very long period in spite of having been given a specific time to attend, had been interrogated on their knowledge of law and generally treated in an arrogant and unacceptable manner. The complainants expressed fear of victimisation if they pursued their complaint. The issue was discussed with the Johannesburg representatives on the Council and the committee was advised that the Council had in fact already apologised to the complainants for the long delays. Nevertheless it was agreed that the Law Society’s disciplinary procedure needed revision; the Law Society Council proposed to enquire from various professional bodies how they dealt with the problem, and also asked for comment from the JAA on the subject. In due course new rules of procedure were published. Four disciplinary committees were established to sit in rotation and Ed Letty and Arthur de Kock were co-opted to the committees. Later, at the request of the JAA conveyancing sub-committee, the Law Society agreed that where a property complaint was being investigated a conveyancer would be co-opted. The NIPR asked for reports on the clerks it had tested and the firms concerned were approached for confidential reports, which were sent on to it. Another threat to the profession which was on the committee’s agenda during this period was the rise of unlicensed debt collecting agencies. The committee reported those they became aware of to the Law Society for action, and monitored the issue of licenses. A problem that in the future became prevalent, arose in mid 1979: The Law Society asked the Association to investigate a report it had received from the Registrar, Mr van Oudtshoorn that some person was advising members of the public on court procedures in divorce cases. This apparently turned out to be an articled clerk helping a friend but this activity, frowned upon by the judges and court staff as a source of problems, (to the extent that on one or two occasions the judge asked counsel to act as amicus curiae) and by the legal profession as encroachment on its specialised and protected sphere, was soon advertised in the newspapers “smalls” columns. Although some persons were charged for this activity, the fines imposed by magistrates were so light that the practice continued unabated. The first black member of committee, Mr Godfrey Pitje, was elected, having already served on the Lower Court sub-committee. In May Mrs Katzeff resigned, as she was to re-marry. Her departure opened a period of difficulty for the committee as apparently no preparation was made for the training of a successor. A Mrs Thomas was soon followed by a Mrs Kuhn who was unable or unqualified to maintain the standard, set by Mrs Katzeff, of attention to the day to day running of the office. During this period also an effort was made to distinguish between the Association and the Circle II by arranging to hold the Circle meeting, to be attended by all the Council members, earlier on the same day as the Association’s AGM. but as those attorneys who did not take the trouble to become members of the JAA were also not interested in the Law Society, these were very poorly attended. It was then decided to add the Circle meeting to the agenda of the JAA meeting and notices were sent to all attorneys, not only Association members, requesting they suggest topics for the agenda of this item. Mrs Kuhn resigned at the end of June. Mr Kidd, who was called in to audit the accounts in preparation for the coming AGM, found that he was unable to do so as the accounts were in a chaotic state and they would not be ready in time. The accounts were presented to members at the 1982 AGM, the auditor reporting a deficit of R1400. He stated that money accounted for by way of receipts had been banked late, no accounts for subscriptions had been sent out nor had there been any monitoring of payments due by members of the medical aid fund. Mrs Kuhn was succeeded by a Mrs Parlow who died in July, and by Mrs Kidson. The refurbished old building (The Supreme Court) and the new annexe were ready in April, the JAA being allocated Room 025 which included a spacious room suitable for use as a boardroom. More than R5000 was spent on new furniture and carpets both for the general office and the boardroom. In addition the committee decided to restore, at a cost of approximately R700, a large table, reputed to have been used by jurors at the beginning of the century and which the JAA had been allowed to used in its old office. Restored, the table turned out to be a beautiful antique which took pride of place in the boardroom. A member, who wished to remain anonymous, donated a fine picture which was hung over the table. Initially the Law Society suggested that it might use the boardroom for disciplinary hearings involving local attorneys but as its ventilation was poor and the reception office was too public it was finally considered unsuitable. The attention drawn to the ventilation problem, however, had a useful result for the JAA; the Council paid for an air-conditioned for the room! The relationship with the Law Society became particularly productive from about 1981 onwards when Council members representing Johannesburg attorneys, undertook to attend committee meetings to report on the activities of the Law Society. In order to maintain continuity this duty fell to Ed Letty and Michael Pinnock, and later the Director of the Law Society Mr Grobler and his deputy Mr Prinsloo who also arranged to let the committee have copies of the minutes of Council meetings for information. Accounts presented to members at the 1982 AGM, the auditor reporting a deficit of R1400. He stated that money accounted for by way of receipts had been banked late, no accounts for subscriptions had been sent out nor had there been any monitoring of payments due by members of the medical aid fund. Mrs Kidson (now Mrs. van Tonder) was soon discovered to be both unreliable and dishonest. Fearing that she would be blamed for the shortfall in funds, Mrs Mosiatlhaga drew attention to Mrs van Tonder’s modus operandi; she called at the office each day, took the day’s cash takings and disappeared. Mrs van Tonder was immediately dismissed. The chairman Rob Sceales and Peter Briggs after spending two days in the office investigating the Association’s financial position, found that cheques in payment of suppliers’ accounts had been signed but not posted nor had the Receiver of Revenue and Unemployment Insurance Fund been paid. Furthermore Mrs van Tonder had cashed a number of cheques, ostensibly for petty cash and signed by one, instead of two, of the authorised signatories, each without the other’s knowledge. Eventually an amount of approximately R5000 was identified as stolen and Mrs van Tonder signed an acknowledgement of debt undertaking to pay that amount by way of instalments. After R600 had been recovered she defaulted, judgment was obtained against her for the balance and Section 65 proceedings were instituted. The outstanding amount was never recovered and was written of in 1985. The office situation was reported to the committee at its next meeting and members were detailed to deal with the various problems which had arisen, dealing in particular with the Receiver of Revenue and the UIF. Len Ettlinger’s daughter Kim agreed to help out until a new appointment was made. In April Mrs Agnes Mosiatlhaga was employed to assist with routine office work and the use of the copying machine. The JAA had 900 members. Staff problems arose with regards to the The Medical Services Plan, due to these problems experienced in the office, accounts became chaotic. The committee thus decided to withdraw and the few members were advised to join the organisation as individuals. Miss Wolkin spent the first few months of her tenure reconciling the accounts and endeavouring to obtain payment of outstanding subscriptions. The Registrar of Deeds, advised that all persons attending the registry had to carry identity cards. To assist members, and with the Registrar’s agreement, Miss Wolkin made arrangements with Fidelity Guards to attend at the Association’s office at specific times to take photographs and prepare the cards. This kept the office busy for several weeks as almost 1000 cards were made. The Courts were advised of the project and agreed to accept the cards also. The JAA made a small profit. In March Mr Cowan and Mr Broadley, who apparently had experience of the London system, were at their own request, invited to address the committee on their proposed document exchange system. The men were advised to canvas individual members but the committee took no active part in the successful establishment of their “Docex” business. 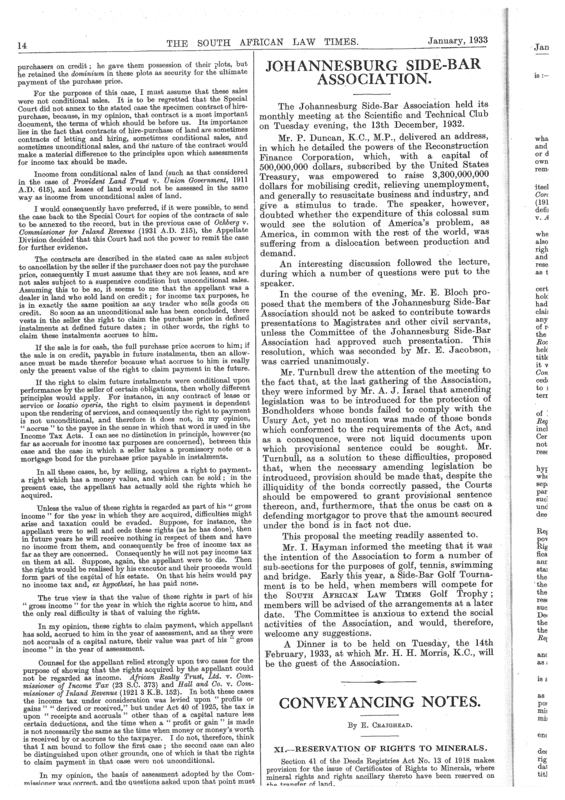 After 1983 Newsletters proved to be so useful and sought after that the committee received requests from out of town attorneys to be placed on the mailing list as well as requests from advertisers for space, which if suitable, were accepted by the committee at rates based on but much lower than charged by de Rebus. The accounts of the Medical Services Plan, and outstanding subscriptions were finally settled. Rob Sceales attended the Law Conference and submitted a written report which was not wholly complimentary. Miss Wolkin also attended to and simplified the bookkeeping system before handing it over to Mrs Minnie Huyser who joined the staff on a part time basis in. An additional problem was discussed; some attorneys could not afford to pay a reasonable, or any, salary to a clerk and the possibility of offering bursaries or subsidies to firms in this position was debated at the May meeting of the committee and Mr Hooper undertook to draw a memorandum for submission to the Law Society on the subject. The following month the committee was advised that the Black Lawyers Association was in fact administering such a scheme. In December a copy of the latest newsletter and an application form were sent to all young practitioners, together with an application form and clerks were recruited as they visited the office on their principals’ business. Seun Moshidi was co-opted and became the first black member in the history of the Law Society of the Transvaal. The Association lent a new group of articled clerks support in an effort to restart their organisation. A meeting, atttended by Dr Tim Burrell, Arthur de Kock and John Schlosburg and 12 articled clerks was held in the Association’s boardroom. The committee again assisted with the drafting of a constitution and a donation of R150. It was announced that the Bar had abolished its tariff of fees and that the Association of Advocates had replaced it with a list of recommended minimum fees. The Trust Bank agreed to sponsor the publication of the newsletter in booklet form and a logo design drawn by a member was approved to enhance its appearance. Mrs Mosiatlhaga asked the committee to lend her R6000 to enable her to buy a house. Miss Wolkin supported her request, referred to her difficulties in finding suitable accommodation and suggested that the committee could rely on cession of the proceeds of her provident fund as security in the event of her leaving the Association’s employment. The request was referred to Michael Pinnock for investigation and the loan was in due course granted, after Mrs Mosiatlhaga obtained a bond on a property and signed the requested cession. She also signed a stop order on her bank account and the loan was repaid at R100 per month. The auditor pointed out that he was unable to verify all items in the accounting system in detail. Miss Wolkin pointed out that the activities of the office were such that it would be necessary to keep track of a very large number of small transactions, many in cash, which would be time consuming, possibly requiring additional staff and suggested that the exercise would not be worthwhile. She did however do a costing exercise on the copy machine and the telephone as a result of which an application was made to the Post Office to supply metering machines for the telephones used by members visiting the office. The Trust Bank sponsorship was not renewed and no other bank could be persuaded to assist. In any event the need to use a printing firm meant delays in the issue of the newsletter and the transmission of urgent information to members and the committee eventually reverted to using its own office facilities. The committee bought Fax machines and offered it for use by members; small firms in the vicinity accepted, but within a year even these decided to acquire their own machines and the machine was thereafter used by members only to communicate with their offices while working in the court. JACA started functioning and continued to do so for some years, its chairmen for the time being attending the Association’s committee meetings and reporting on their activities which included social functions and the occasional lecture on professional topics reasonably regularly. The Committee suggested that the public should be warned that only attorneys were entitled to recover collection costs from debtors. Ms E A (Nakka) de Klerk, the first woman to be elected since Gertie Horwitz retired joined the committee in 1988. Although Norman Barling addressed the August committee meeting on the reasons for their opposition, the committee decided not to make any recommendations to its members on the issue. When the Law Society, at somewhat short notice, called a special meeting to obtain members’ authority to buy the property, this group of attorneys organised so many proxy votes that the motion was defeated and the matter was shelved. The committee was approached by clerks who drew attention to the manner in which Johannesburg candidates were disadvantaged in that they had to travel to Pretoria to sit the admission examination and asked that the committee support it in its request that the Law Society to arrange a suitable venue in Johannesburg. The committee did so, and agreed to assist. But the request was refused on the grounds that Council was unable to deal with administration of two venues. This expression of lack of confidence in the Law Society caused dismay in the Council and Ed Letty was appointed to investigate the reasons therefor so that and problems that existed, particularly in Johannesburg could be addressed. He arranged a series of “get togethers” at the Carlton Hotel at which groups of attorneys were invited to express their views, but it would appear without clarifying any particular issues. At its March meeting the committee was informed that the Law Society Council was considering buying the Pretoria Club premises which were coming onto the market, claiming that there was no room for necessary expansion in its existing premises; the Association of Law Society would be invited to share the premises. However the other three Law Societies objected to this and the ALS withdrew, whereupon some Johannesburg attorneys, fearing that the acquisition would lead to an increase in fees, expressed opposition to the scheme which they felt would benefit Pretoria attorneys only. Early in the year. Again, some members objected to the standard letter advising that a complaint had been lodged, and requested that they should be allowed to see the complainant’s affidavit and correspondence. In spite of Council’s warning that these were often abusive and defamatory, Johannesburg attorneys insisted that copies of them be given to them and Council concurred. A group of members, apparently led by Mr Friedgut, raised a further matter for complaint – Section 74 of the Act incorporating the Law Society of the Transvaal, unlike the Acts under which the other three provincial Law Societies were established, empowered its Council to make and amend rules without consulting its members- and proposed a resolution at the Association’s AGM demanding that this section be brought in line with the other Law Societies. The resolution was defeated. An eventful year in the JAA office. Early in the year the committee was advised that major changes were to be made in the old part of the Supreme Court and that its office and boardroom in Room 025 were earmarked to be turned into a court. There were repeated processions of architects and builders through the office and at the end of the year the office was relocated to Rooms 028 and 029, the latter large enough to accommodate a boardroom but without access to the office in Room 028. While building operations were in progress the committee obtained permission to break a door between the offices at its own expense. The builders on the job were contracted to do this, the job turned out to be more difficult than they anticipated; Room 028 had been a holding cell for accused persons in criminal matters and were of solid concrete! A series of cocktail parties hosted jointly by the Association and the Law Societies was held at the Johannesburg Sun, the Sandton Sun and the Carlton Hotels to give members an opportunity to meet elected officials of the profession on an informal basis, but as usual the response from Johannesburg attorneys was poor and the results debatable. Council renewed its negotiations with the Pretoria Club, with regards to the Law Society Council buying their premises. The Law Society Council was frequently enriched by the co-option and later election of valuable and talented members of the JAA’s committee. Indeed as vacancies occurred the committee was invited by the Council to submit names for its consideration. The matter of arranging a suitable venue in Johannesburg for Clerks to sit their admission examination, was again raised and eventually the Law Society agreed to use premises at Gallagher Estate, which proved unsatisfactory. Miss Wolkin indicated that she wished to retire and Mrs Juliette Reich was appointed to be her assistant and successor. The transfer of duties was smooth and the Association avoided the trauma associated with previous changes of office staff. Len Ettlinger Jnr retired, becoming the longest serving committee member in the Association’s history.